On roadside vegetation north of Kabarnet in the Tugen Hills, Kenya. Dec. 2015. 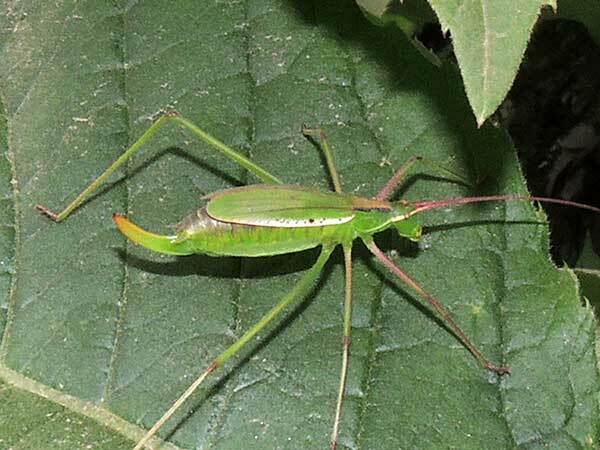 At the posterior of this female is a curved egg-laying organ, the ovipositor. Katydids are largely nocturnal, but this one was active about two hours before sunset. Primarily herbivores, they feed on a variety of plant leaves and flowers. Some species have a narrow range of preferred plant species. Copyright Michael J. Plagens, page created 22 Jan. 2016.